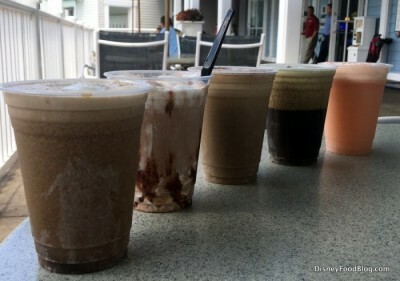 Beaches & Cream at Disney’s Beach Club Resort has recently added “adult” hard floats and milkshakes to the menu. These new cool concoctions are created with beer – including Guinness Stout – hard ciders, and hard root beers plus ice cream. Guests (21 and over, of course) can choose from a S’mores Shake, a Classic Root Beer Float, a Grasshopper Float, a Tropical Sunrise Float, and a Stout Float. The S’mores Shake is made with Amarula Crème liqueur, Cream de Dark Coco, and chocolate and vanilla ice cream. It is topped with marshmallow, chocolate sauce, and graham. If you’re a fan of hard root beer you’ll want to check out the Classic Root Beer Float made with vanilla ice cream and Hard Root Beer. The new grownup shakes and floats are available inside Beaches & Cream and at the to-go window. If you order yours to go it’ll be served in a plastic cup – but it’ll be just as delicious. Disney Hotels Fan is the place to come to read all about your favorite Disney Resorts!